By Caz | April 9, 2019 | This post may contain affiliate links, which means we may receive a small commission, at no cost to you, if you make a purchase through a link. Read our Disclosure. I’ve been so fortunate to see places around the world of exquisite beauty. It’s hard to say what is your favorite place and why. I can’t say whether mountains, deserts, or beaches fill up my soul more than the other as each has its place and separate purpose. But there are some places that stand above the others. They have this special magnetic pull that pulls you into their beauty. They enchant you. They heal you. They call you to look in so you can create something better when you look out. You feel something ancient, timeless, spiritual and God Like about it. 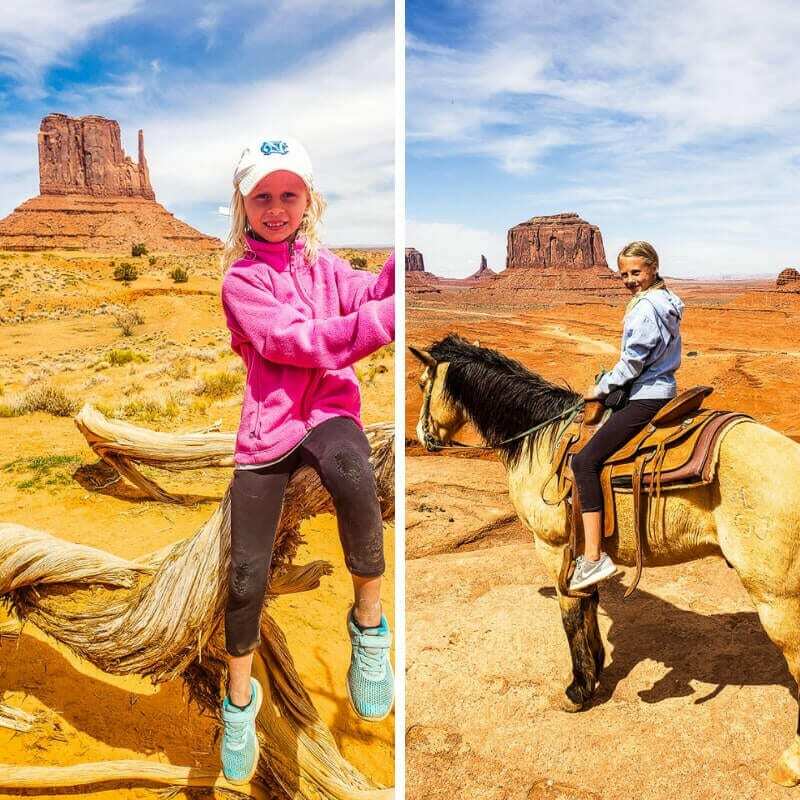 Monument Valley is one of those places. You know when you’ve arrived even before you see it. The air electrifies somewhat and you feel called to the present. Then you see it and it connects to you and opens you up. 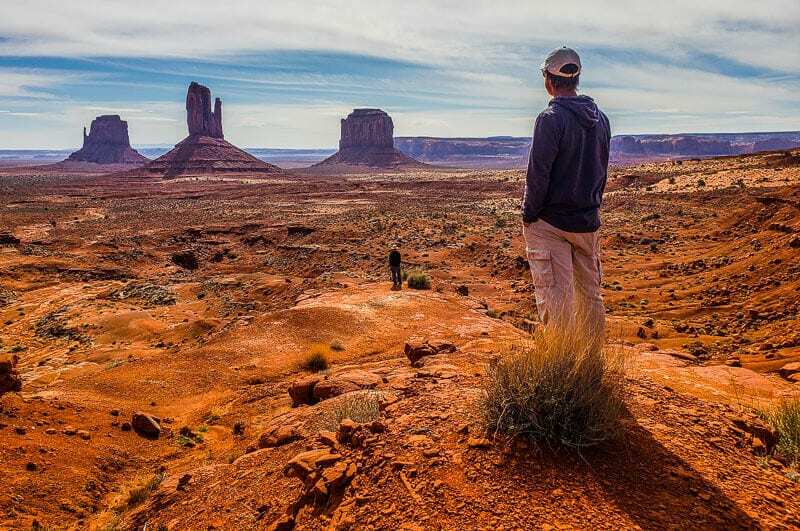 Monument Valley has the same spiritual energy of Uluru, one of my favorite places in Australia and the world. 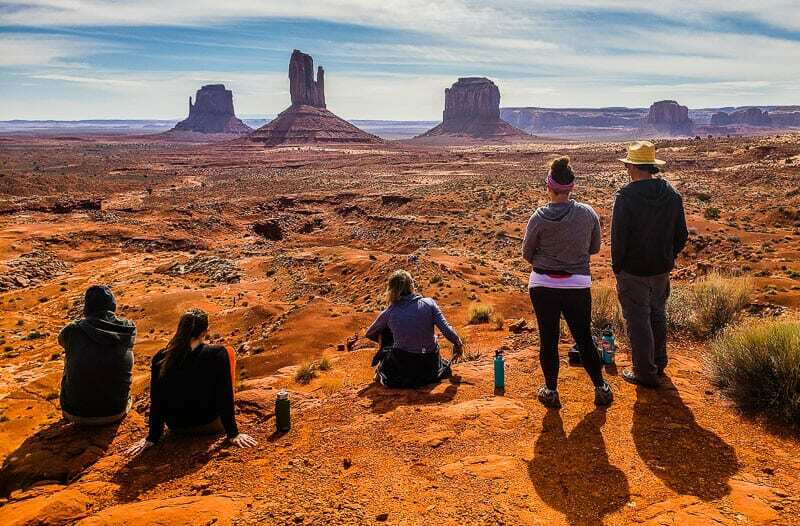 Now Monument Valley in the USA sits beside it as a place that rises way above the others. 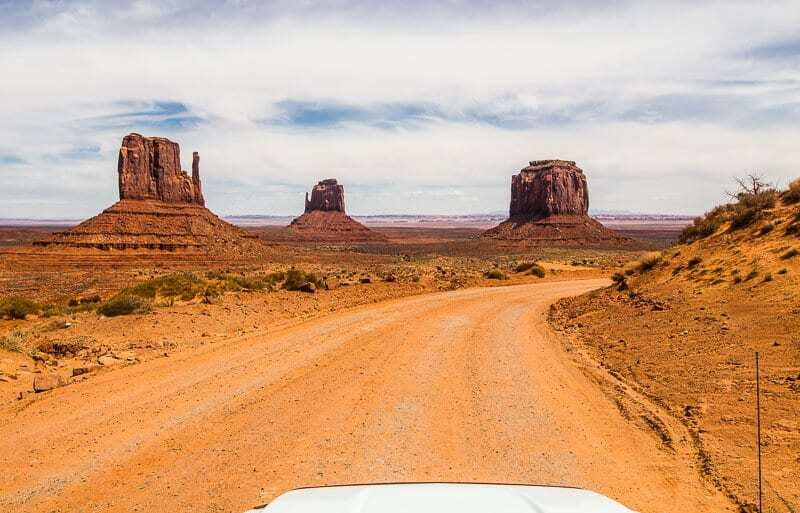 Like Uluru, it’s mind boggling to think in the middle of nowhere rises these magnificent buttes weathered by time or perhaps just created by the hands of something special. This week on our road trip across the USA was something special. We boondocked (dry camped) for the first time and now we’ve worked out all the kinks it looks like we’re adequately prepared to do a lot of it, which deserves a celebratory dance for the money we’ll save, the kinder it is to the environment AND our ability to now stay in more off the beaten path beautiful locations like below. 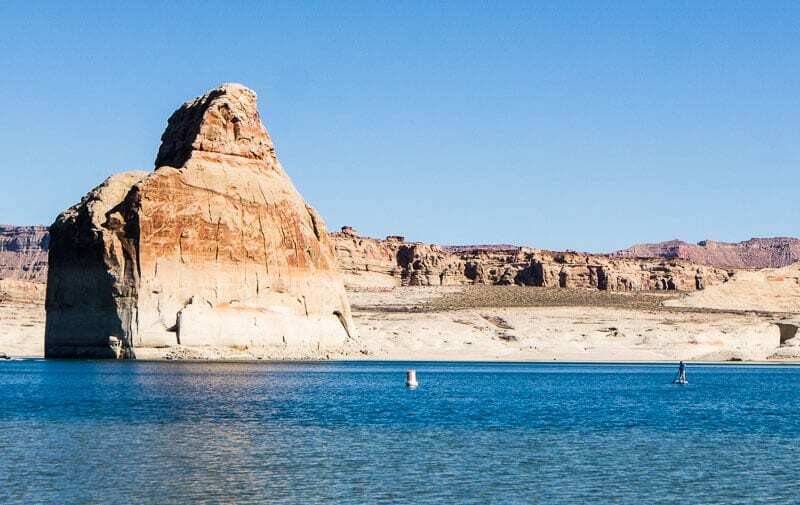 Not only am I grateful for magnificent mesas and buttes this week but also water. You don’t realize how much you use (or waste) in a normal life. We have to be very careful with our water as it disappears so quickly. I’m grateful for every drop. We reconnected with our friends from Crazy Family Adventure this week and will be with them for the next month at least. 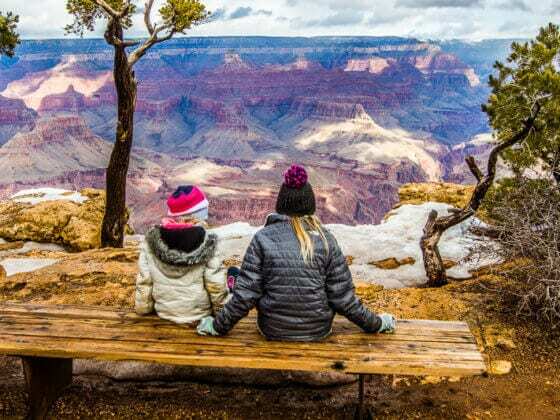 This week 18 wrap up of our USA road trip shares our adventures from Saturday to Friday. 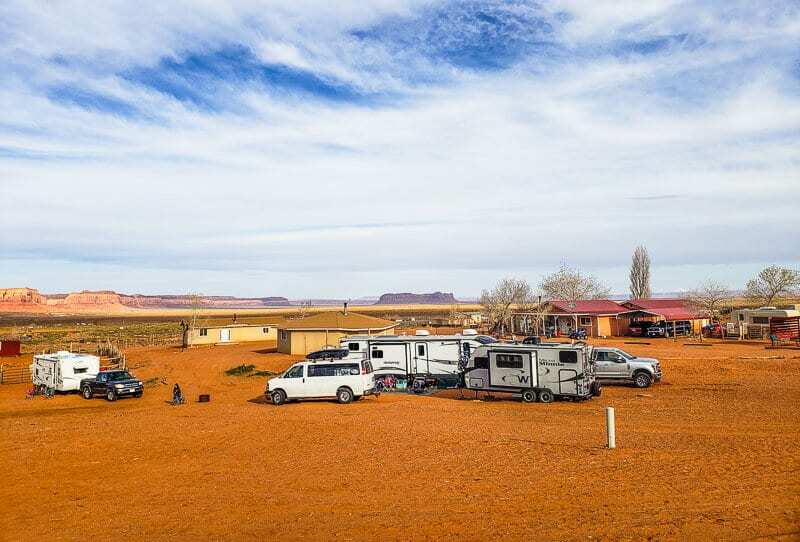 We stayed in Glen Canyon Recreation Area for 5 nights. This was mostly a time for us to relax in a gorgeous lake setting, catch up on work and figuring out how to get our solar working. 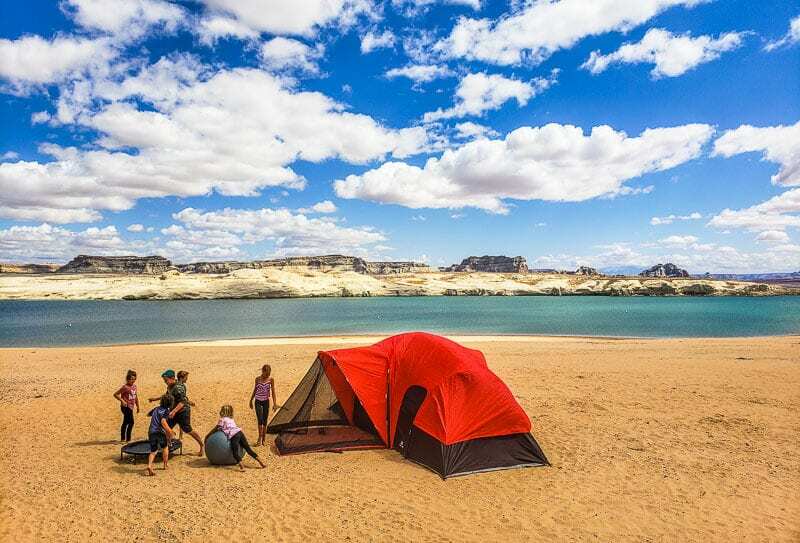 Lone Rock Beach campground was the perfect playground for kids AND adults. I spent the morning working out followed by an icy dip in the lake – like a 2 second dip. 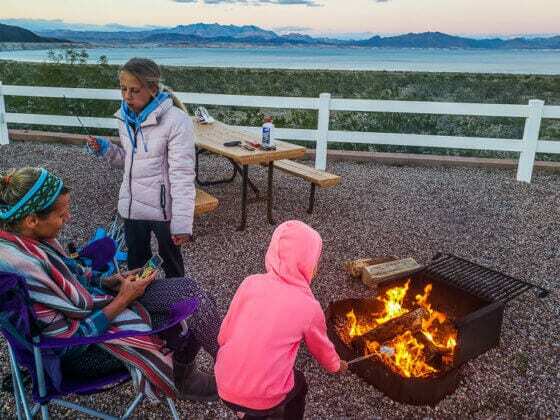 The day was spent doing stuff – work, organization, fixing, relaxing, playing, And the evenings were spent playing cards and chatting around a campfire. Isn’t that bliss? What added to the bliss was that the girls had friends to play with. We had pretend weddings, 24 hour tent challenges, and a half day Survivor challenge over on Lone Rock. The kids kayaked over there and spent four hours playing and trying to stay there as long as possible. The hunger pangs drove them back into our arms. 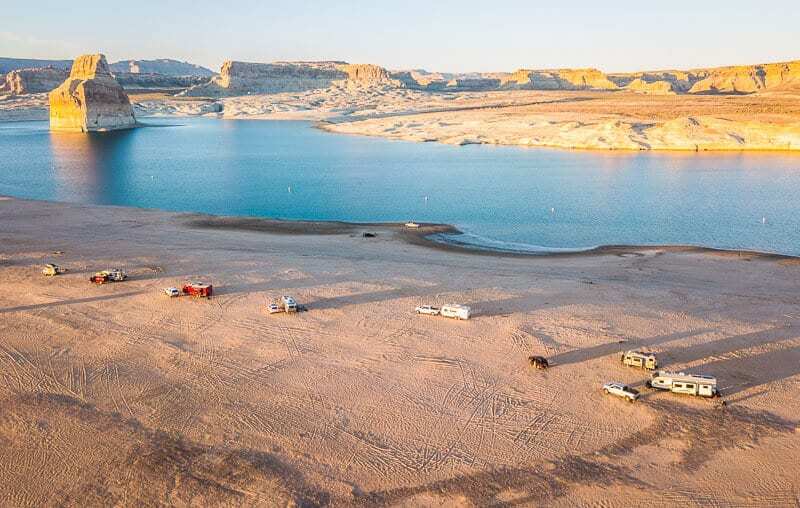 I would love to return to this spot for more camping and to explore the Glen Canyon Recreation Area more in-depth. There is a lot you can do here. We didn’t stay on the beach the entire time. 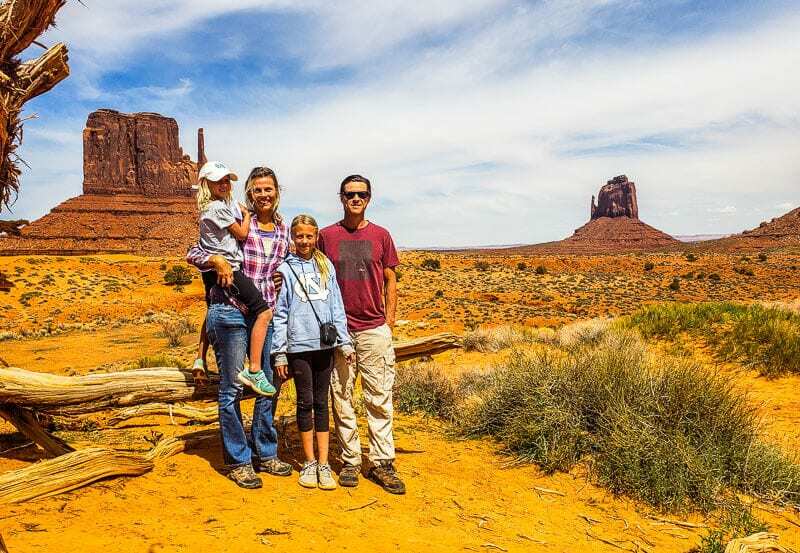 We did the following things in nearby Page, Arizona. 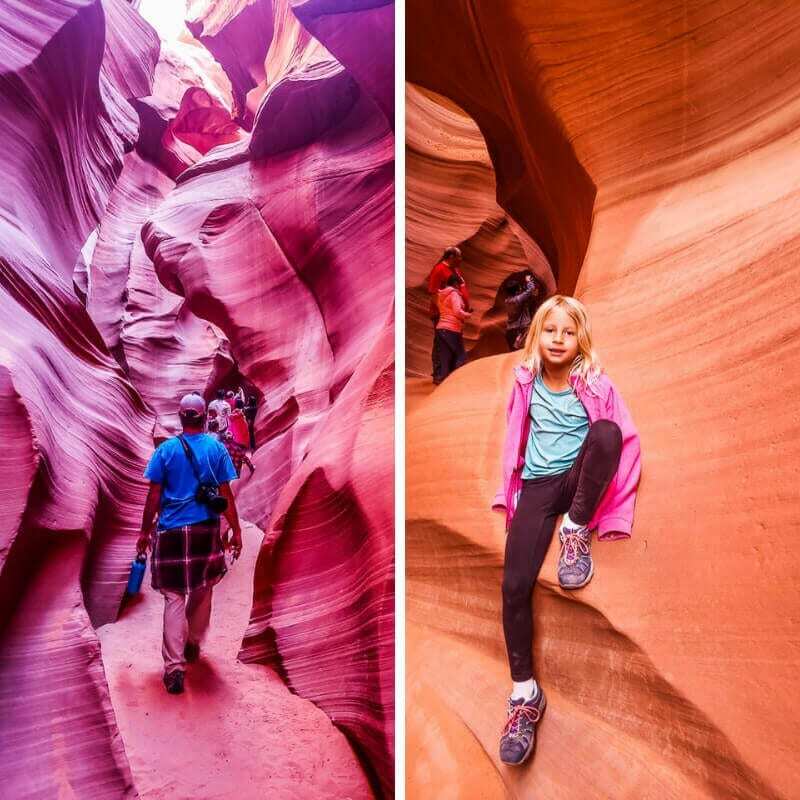 We were debating whether to go to Antelope Canyon as we heard people say it was overrated. They complained about the crowds and having to wait in a line just to take a photo. I’m so glad we decided to go. It was awesome and unlike anything I’ve ever seen. 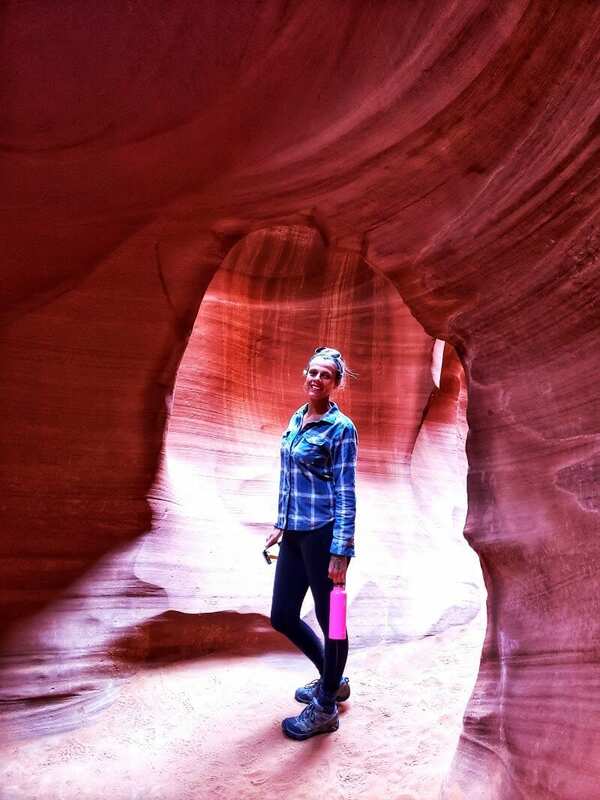 There’s a tiny crack in the ground and below is this wonderful slot canyon that changes color throughout the day thanks to the light filtering in through the narrow opening. It was busy, although not busy season. We had plenty of time to wander the 430 meter path through the canyon taking photographs and marveling at the smooth polished rock that appeared as red, orange, yellow and purple for us. 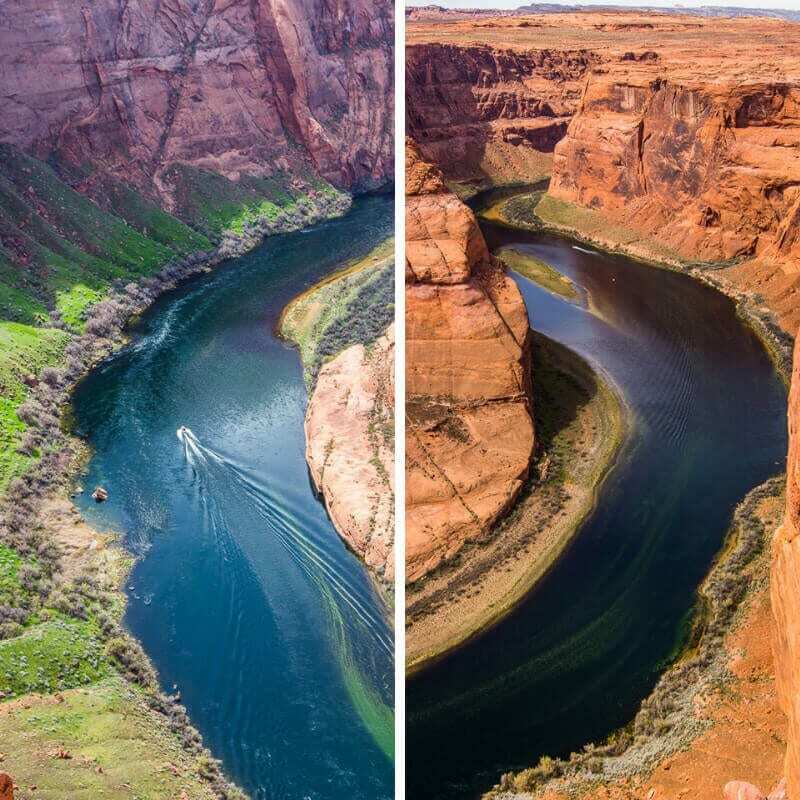 Book your Lower Canyon Tour here. (It’s best to book in advance as they fill up quickly. 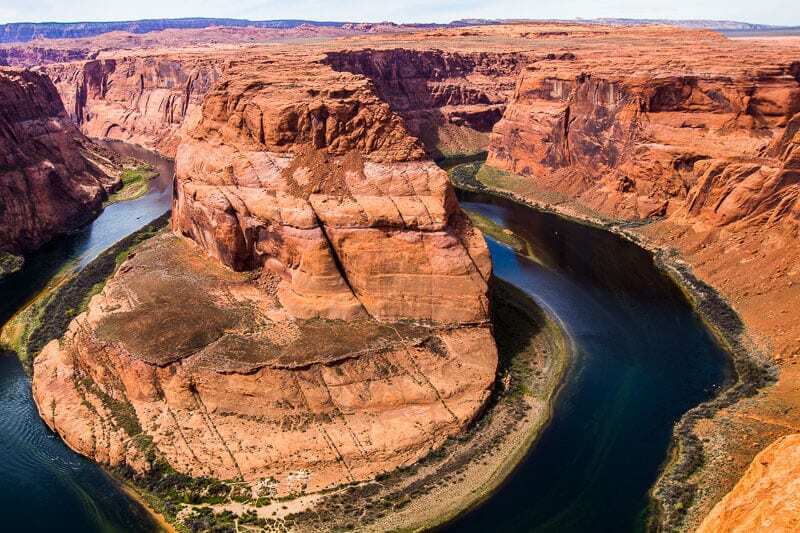 You’ve probably seen plenty of images of this famous bend in the Colorado River as it winds through Page in Arizona. I loved the emerald green of the river below and we saw many boats cruising by. It was spectacular and you only need a short amount of time there. We were quite taken aback by the number of people going close to the edge for photos. PLEASE don’t do it. It’s not worth it. Anything can happen in a split second and too many people have been falling off cliff edges dying recently. There is no photo or number of likes worth it. My heart was dying watching a young boy walking tentatively towards the edge braving himself to go forward. I’m not sure where his parents were but I took on the village raises the child thing and told him to come on back that it was too dangerous for him to do that. It makes my stomach turn watching it. 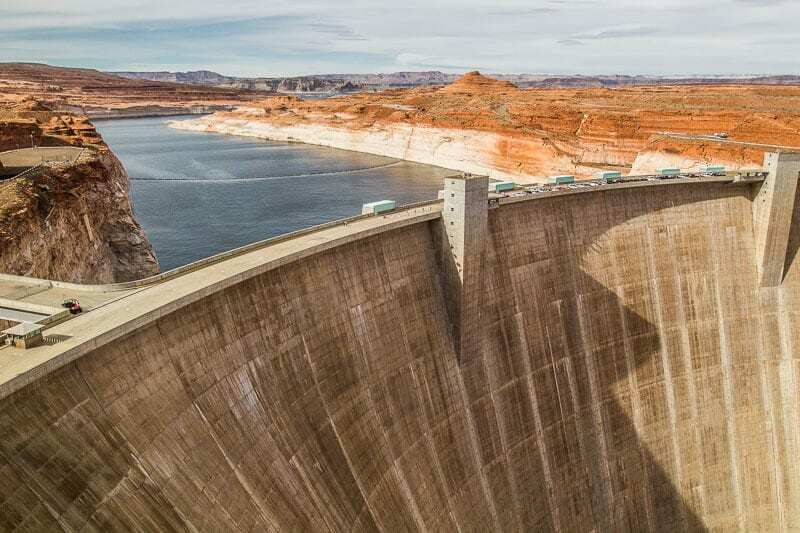 It’s worth stopping off to the Glen Canyon Dam. The visitor center there is free and there is a small museum to learn more about the construction of the dam and the importance of water. There are great views into the dam and you can take a your if you like. We skipped the tour. 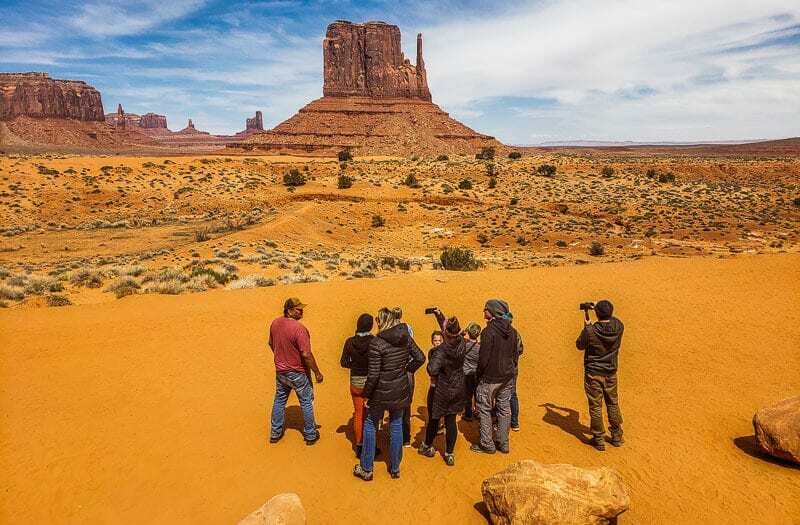 You can either self-drive the 17 mile loop road through Monument Valley or join a guided tour with a Navajo Guide. 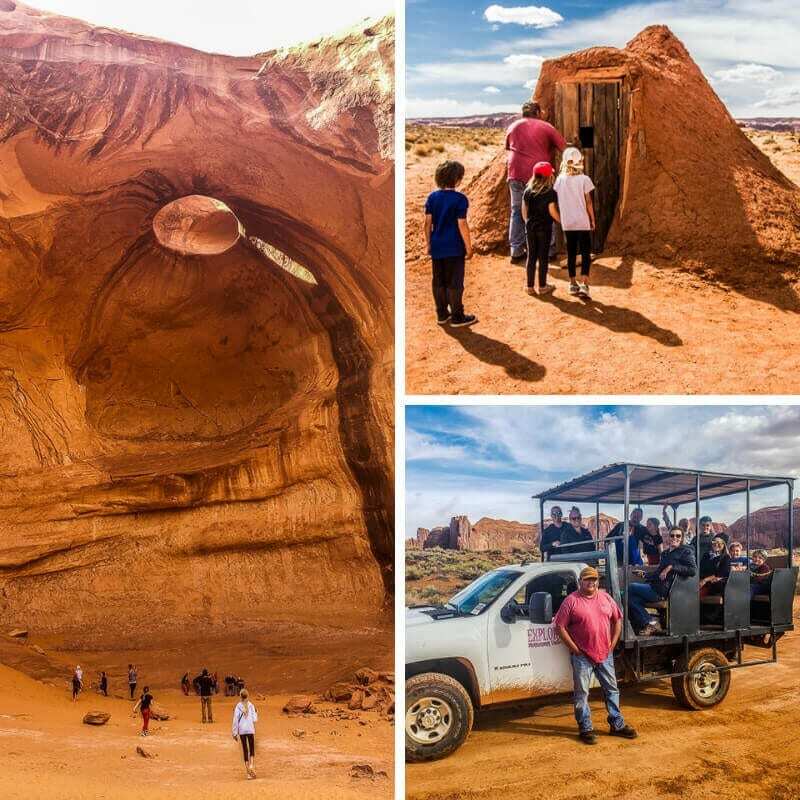 The guided tour takes you to restricted areas you can only access with a Navajo guide. It was an incredible experience and one of the highlights of our USA road trip so far. Our guide, Charles was very sweet and accommodating for our large group of 8 kids and 6 adults. We rode around in an open jeep which made the experience loads of fun especially some of the adventurous off-roading tracks we went on. It was great for the kids as they could chat and sing and we weren’t dealing with the noise in an enclosed vehicle. We saw loads of buttes, mesas, and arches as well as petroglyphs, a spring, and even sand dunes. 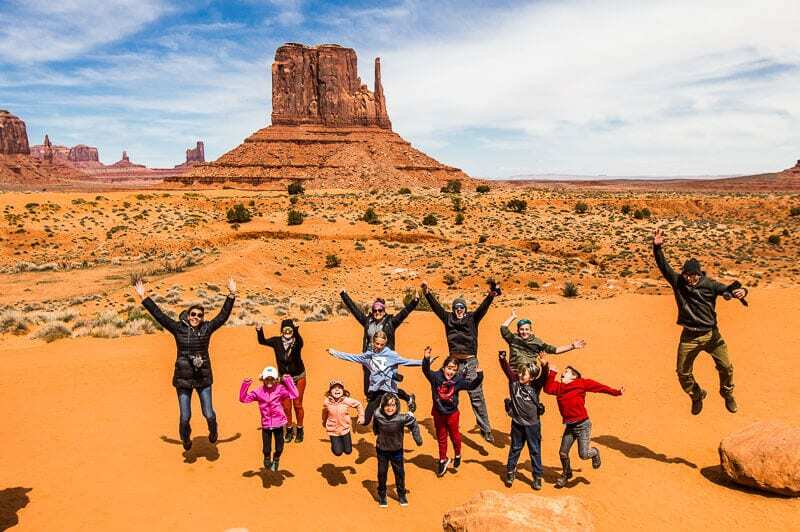 We visited a traditional Navajo home, a Hogan – and learned some of the traditions of the Navajo people. For an extra $10, you can do the sunset or sunrise tour. That would be AWESOME! 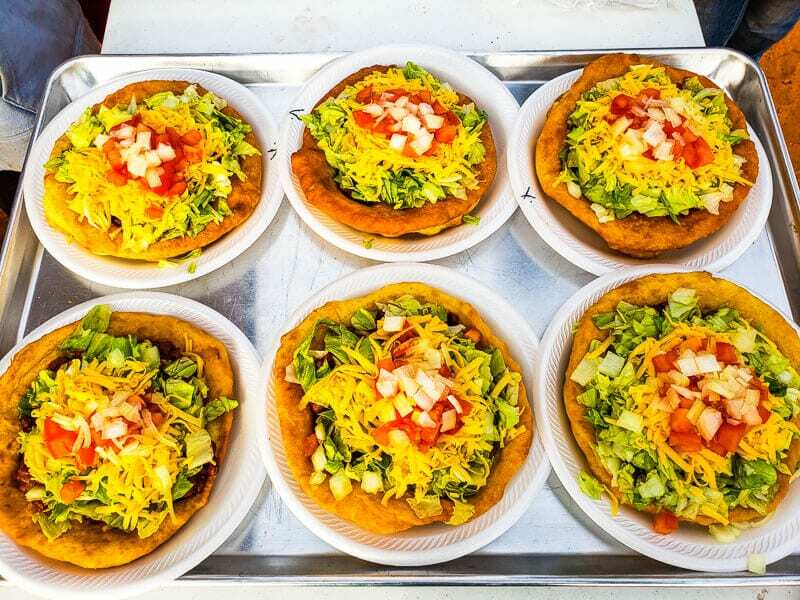 After our Monument Valley tour we arrived back to our campsite to a traditional Navajo Taco for dinner. Our Airbnb hosts (see more below) cooked it for us and it was delicious. It is deep fry Indian bread with the taco mixture on top of it. So very tasty! 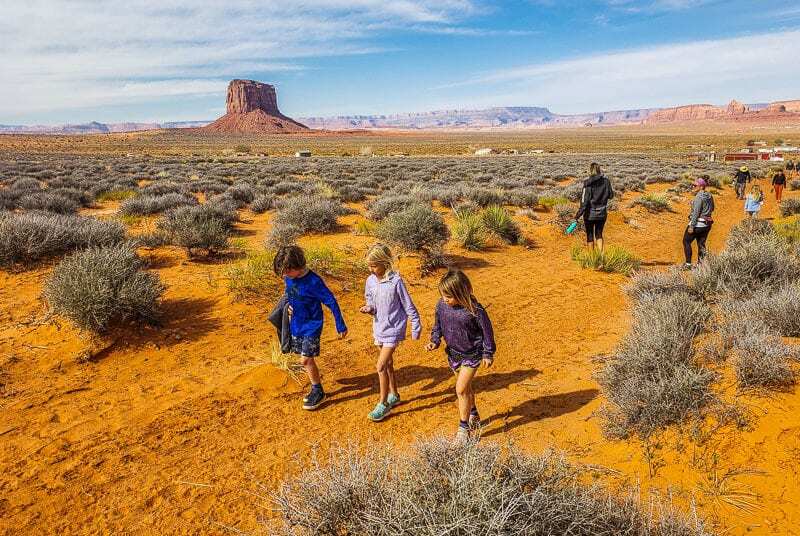 On the morning of our departure from Monument Valley we rose early to walk to a gorgeous sunrise view over Monument Valley. I suggest you don’t miss it! This viewpoint was near our campsite. 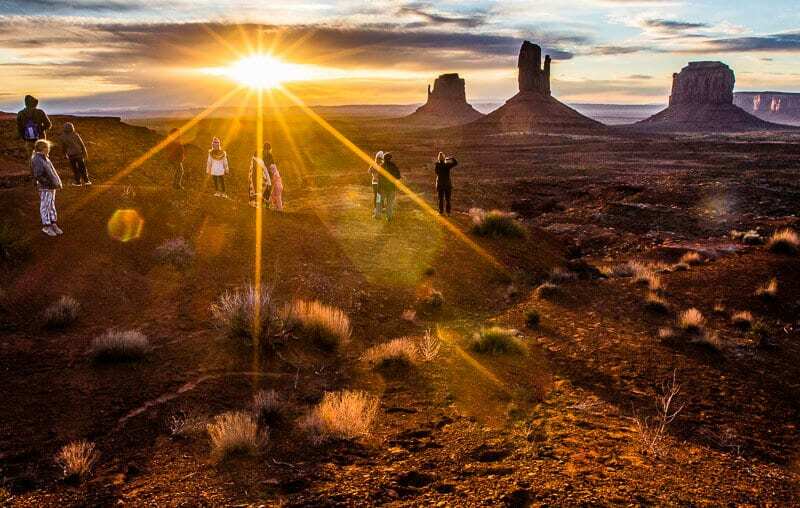 I am sure there are plenty of places in the Monument Valley for sunrise and sunset experiences. Time is irrelevant and difficult to track when you are staying on a border with a state that doesn’t follow daylight savings. We kept going back and forth on time and ended up not knowing. 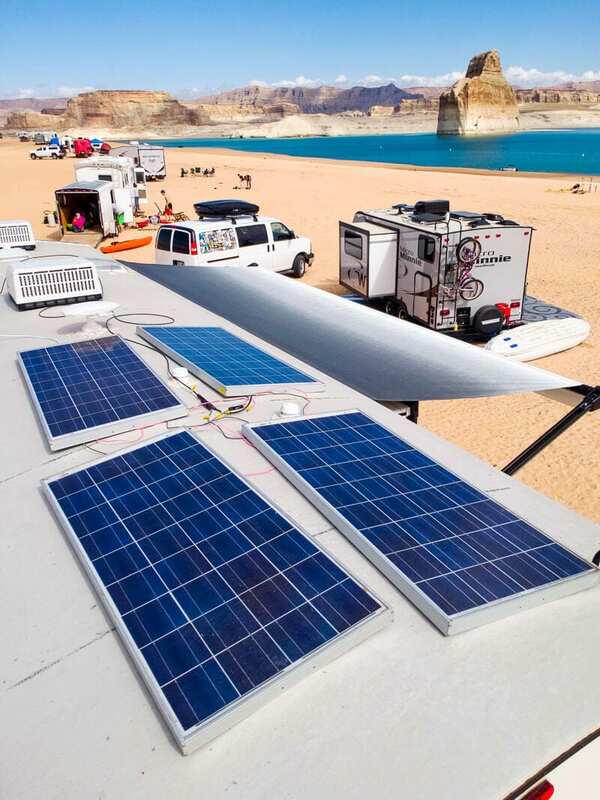 Our solar power was not working because two of our four batteries were dead!! Thanks to Craig Royal for figuring that one out. As we’re not able to replace those two batteries yet, we still have to use our generator to top up our other batteries once a day as the solar power can’t generate enough to run our fridge with just the two working batteries. It’s a much better idea to secure your solar panels to the roof rather than take them in and out and put them on the ground which is what were were going to do. That is a lot of work!! Having them on the roof means they are always charging up as long as the sun is out. Plus there is less chance of someone stealing them! We also couldn’t top up our fresh water in the can from a jerry can. Not having water running out of your faucets is extremely annoying. Thankfully Craig Royal once again came to our rescue and with his scientific brain came up with a solution. I’m not even going to explain it to you, I’m just going to send you to his post and video which shares how he did. You can fill up your water cans in Walmart for 29 cents a gallon. 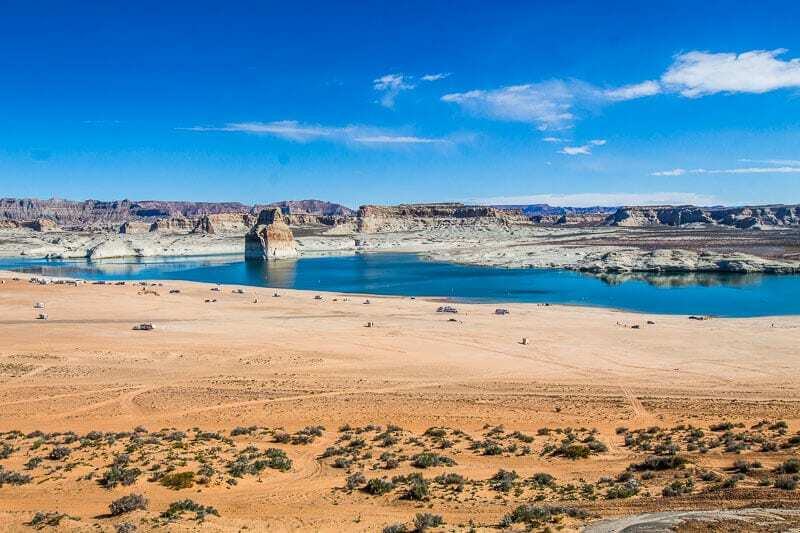 Glen Canyon Recreation Area would have cost us $30 for a 7-day pass. We have a National Parks Pass which gives unlimited access to federal lands. It costs $80 a year. It’s absolutely worth it for a trip like ours and saves us hundreds of dollars. I’m surprised by this week’s costs, especially since we free camped. We didn’t spend anything on groceries the week before so I guess that was a big cost this week. And I tend to get hurricane fever when I know we’re going to be away from a grocery store and stock up on a lot of things I probably don’t need. Now we’re free camping, we may have to pay extra to dump our waste. It was an expensive tour week as well, but they were bucket list items! As you saw above this was a magic spot for boondocking. It was off the grid though,not completely free. 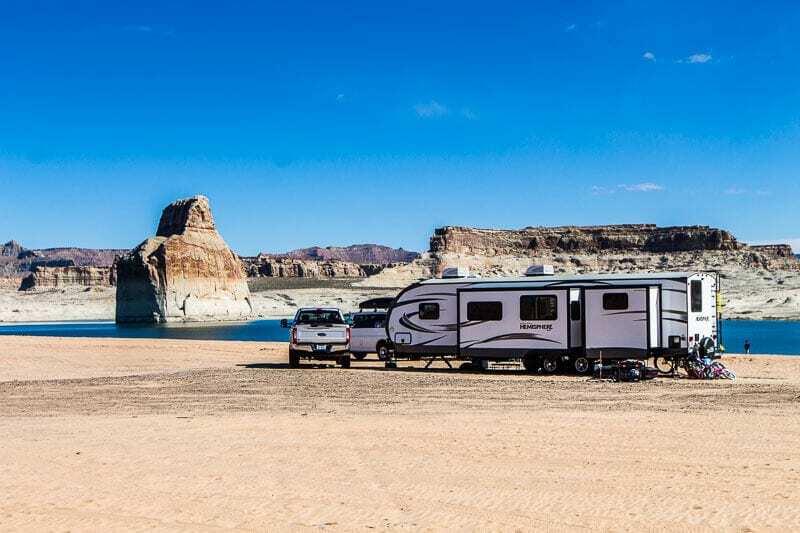 There was a fee as we were camping in the Glen Canyon Recreation Area. But it was only $14 a night. Drive up and find your perfect spot on the beach. Man are we so excited now we don’t have to rely on water and power and can turn up to places like this. I never thought to check Airbnb before for RV camping, but Megan (one of our now traveling friends) discovered it. It was a lovely experience. We camped on the property of Cecelia and Steven and their grandchildren. We had a stunning white horse beside us and who even roamed around our campsite of a morning. And we had beautiful views of the mesas and buttes. 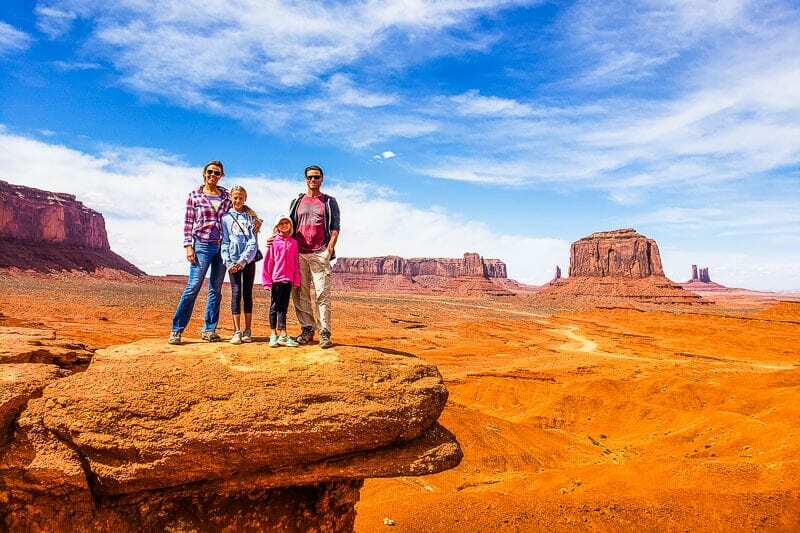 A short walk from our RVs took us to this stunning Monument Valley view. Cecilia sand Steven were very friendly and welcoming and accommodating. I loved chatting with them and soaking g up their gentle, peaceful, Navajo spirit. 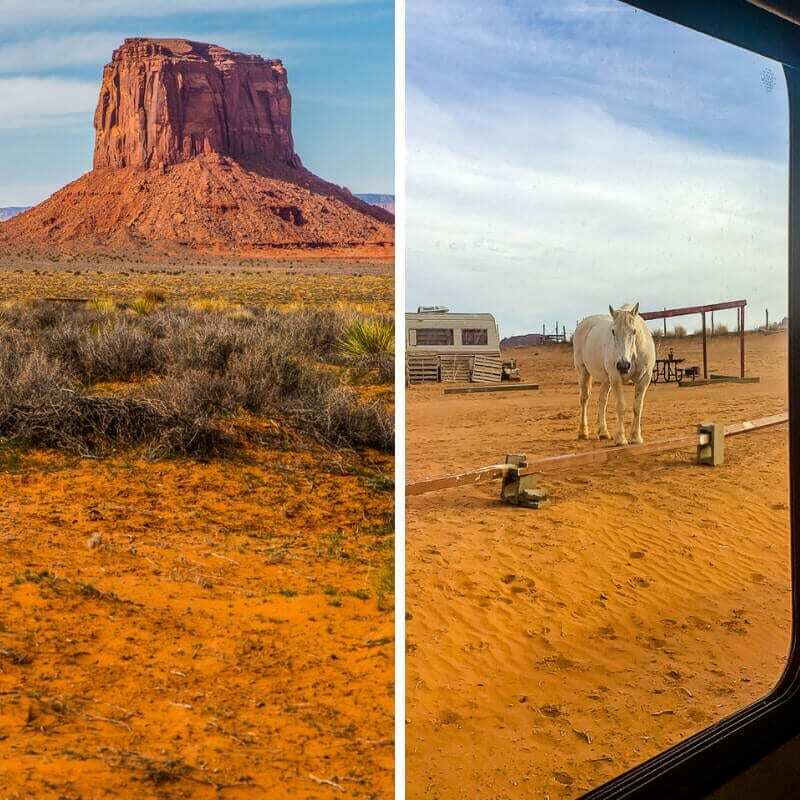 We were right near the entrance to Monument Valley as well. 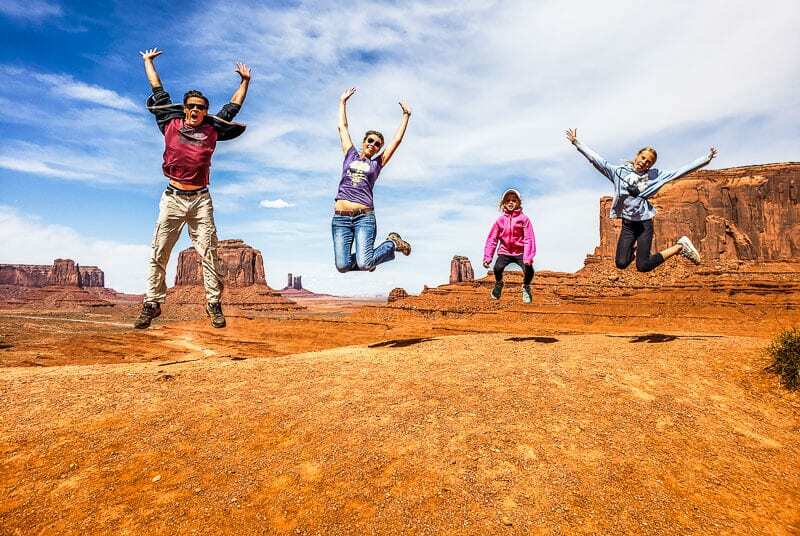 We organized our Monument Valley tour and Navajo Taco dinner with them. You can see more and book a stay through Airbnb here. We’ll be continuing our adventures in Utah. 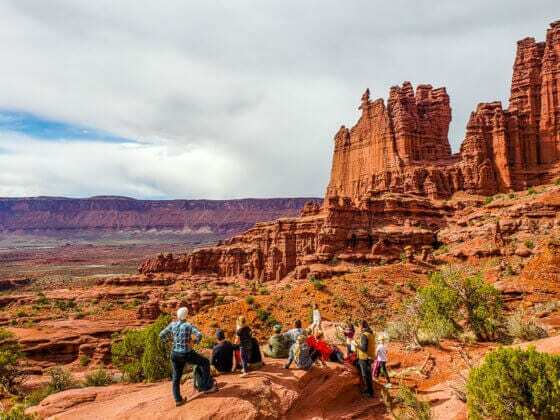 For this coming week, we’ll be exploring the Valley of the Gods, Natural Bridges and Capitol Reef. 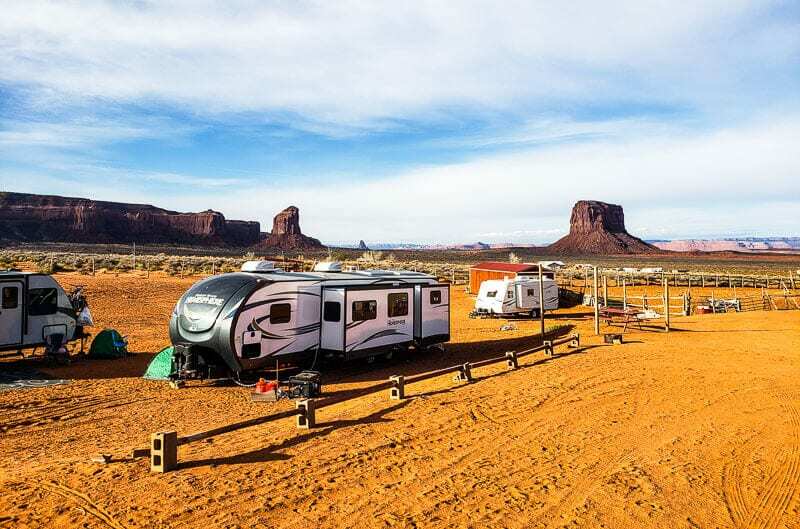 Or we could also just spend a few days in an RV park connected to life. Check out the video of Sabino Canyon and stunning views of Tucson, Arizona.